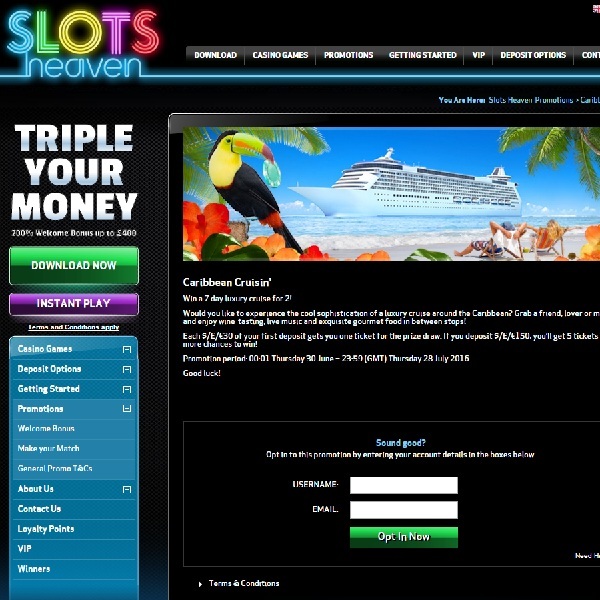 If you’ve always wanted to go on a cruise around the Caribbean then head over to Slots Heaven Casino as soon as possible as they are giving you the chance to win one. Each £30 of your first deposit at the casino will earn you a ticket for the prize draw. This means that if you deposit £150 then you will receive 5 tickets and have more chances of winning. The promotion is running until 28th July so there is plenty of time to earn tickets and the prize draw will be taking place shortly afterwards. The winning player will receive a luxury cruise for two in the Caribbean. The cruise will last for 7 nights and will include wine-tasting, live music, fantastic gourmet food and much more. Make sure you don’t miss out, head over to Slots Heaven today to ensure you have a chance of winning.